Dr. Farpour is a research fellow of MSK Radiology, and Dr. Tehranzadeh is Emeritus Professor and Vice Chair of Radiology at UCI, and Chief of Radiology and Nuclear Medicine, VA Long Beach Health Care System-Radiology, Long Beach, CA; and Dr. Maasumi, is a third year post-graduate (PGY3) in the Department of Neurology, Texas Tech University Health Sciences Center, Lubbock, TX. Magnetic resonance imaging (MRI) is an important diagnostic tool for the evaluation of crystal deposition diseases affecting soft tissues, tendons, ligaments, and joints.1 A number of crystals are associated with joint diseases. There are various imaging features for common crystal-related deposition diseases including monosodium urate, calcium pyrophosphate dihydrate as well as hydroxyapatite depositional diseases. There are several known causes of crystal deposition diseases involving the soft tissues, bones and joints, specifically gout, calcium pyrophosphate dehydrate, and hydroxyapatite depositional diseases. 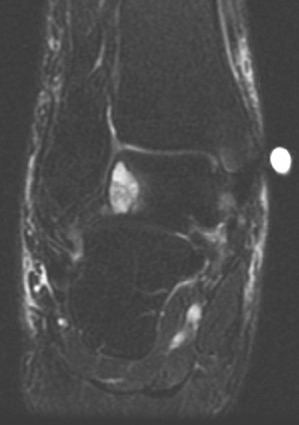 MRI features associated with crystal deposition diseases include size, soft-tissue signal characteristics, arthritic changes, as well as etiology and common locations of such deposition diseases. In the 1960s, McCarty et al12,13 discovered new crystals in the synovial fluid, which were calcium pyrophosphate dihydrate. These were linear or punctuate deposits associated with certain diseases, such as chondrocalcinosis, pseudogout, and pyrophosphate arthropathies. Many diseases have been described in association with CPPD, such as osteoarthritis, diffuse idiopathic skeletal hyperostosis, hypertension, atherosclerosis, and diabetes mellitus, but there are no studies to link them. 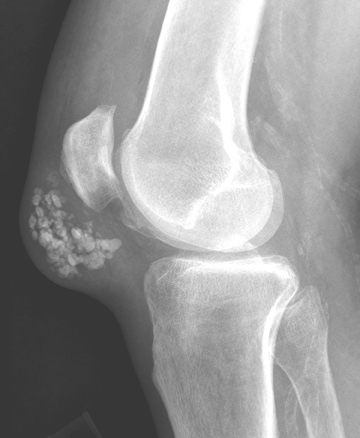 In chondrocalcinosis, the deposits are radiopaque seen as cartilage calcifications. 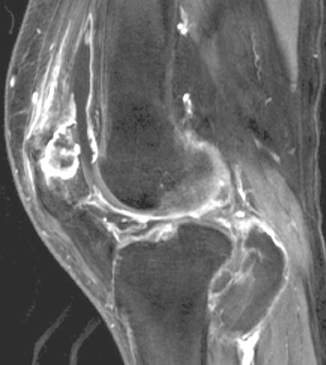 Chondrocalcinosis is asymptomatic and often seen in elderly patients, especially in joints with hyaline cartilage and fibrocartilage, such as the knee and wrist. Pseudogout is very distinct from gout. The most common joints are knee and wrist. It is often seen in women >80 years old, which may be referred to as the disease of octogenarians. 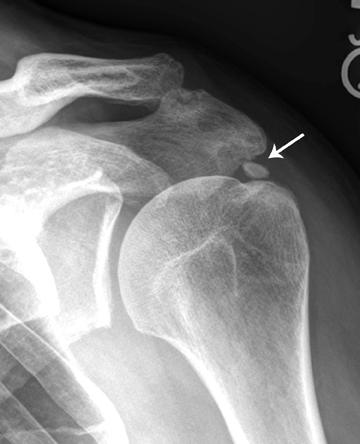 The shoulder is a non-weight-bearing joint and degenerative changes and narrowing and loss of articular cartilage seen in this joint with the absence of prior injury raises the possibility of CPPD (Figure 3). 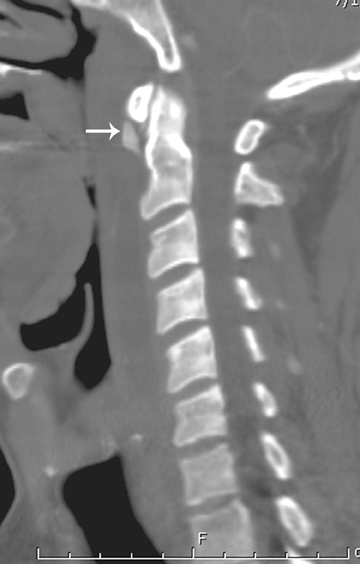 Calcification in the spinal ligaments specifically around the odontoid process is common in this disease (Figure 3). CPPD may be asymptomatic or cause arthritis with severe inflammation or may present as destructive joint disease, which may mimic neuropathic joint. 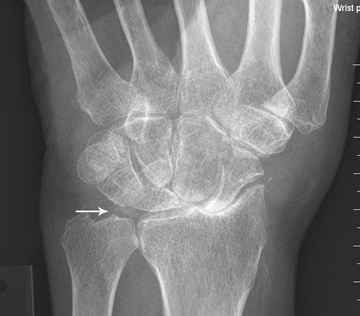 The appearance of scapholunate advanced collapse (SLAC) in the wrist is an example of destructive features of pseudogout seen often in older age groups involved with CPPD (Figure 4). 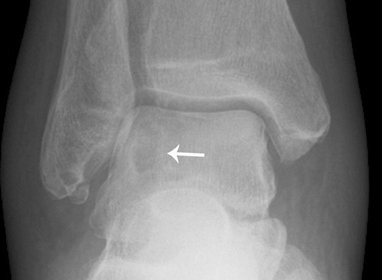 Focal calcifications around joints similar to tophaceous gout may be also seen in patients with pseudogout (Figure 5). deficiency of ALP cofactors, such as magnesium (chronic hypomagnesaemia) due to diet, chronic diarrhea, Gitelman syndrome, and Bartter’s disease. decreased crystal solubility, such as in hypomagnesaemia. These include hydroxyapatite (HA) and calcium orthophosphate dihydrate. Calcium hydroxyapatite comprises most of the bones and various other places in the body. 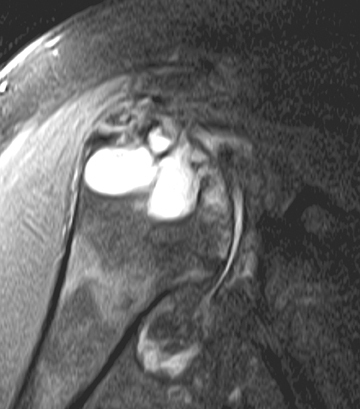 Calcific tendinosis is most commonly seen in the shoulder in the distal supraspinatus tendon insertion at the greater tuberosity of the humerus. Less common locations may include tendons of infraspinatus, subscapularis, and deltoid, wrist, elbow, gluteus maximus, knee, and neck. Rarely erosion of bone adjacent to calcification at the insertion site of the tendons can be visualized. 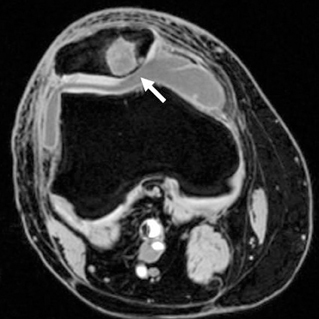 Hayes et al21 described 5 cases of calcific tendinosis with radiographic evidence of cortical bone erosions, including 2 at the pectoralis major insertion on the proximal humerus, 2 at the insertion of the gluteus maximus, and 1 at the insertion of the adductor magnus. 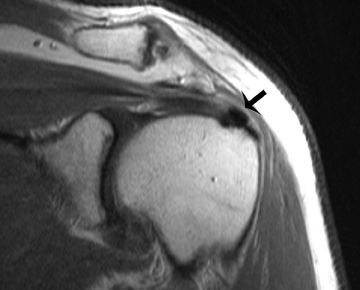 The right and more dominant rotator cuff is the most commonly involved location of calcification, specifically at the insertion of the supraspinatus tendon into the greater tuberosity. 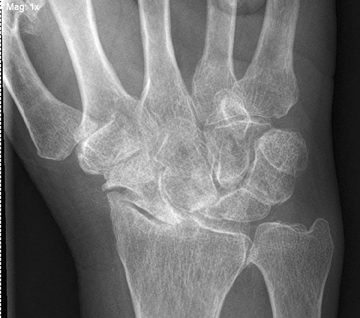 This makes the axial or external/internal rotation views important when looking for calcifications in this area. 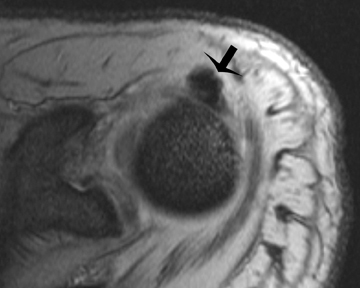 In other words, it is easier to see calcification in the supraspinatus tendon on external rotation and in the infraspinatus tendon on internal rotation. When crystals in the rotator cuff rupture, they cause synovitis. 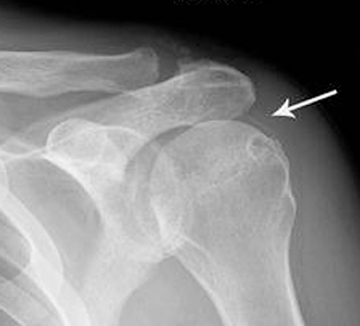 In addition, they accumulate in the more dependent area if they are in the joint, forming a zone of calcification and potentially predisposing the patient to rotator cuff tears.24 Interestingly, these foci of calcifications may go through resorption later on and can disappear on follow-up radiographs. 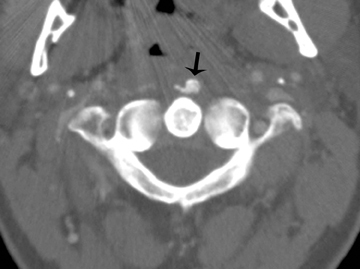 On MR imaging, HA deposits are of low signal. 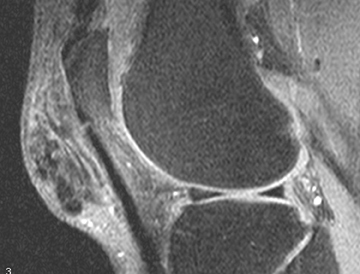 Moreover, there is often overlying inflammation and edema, which the radiologist may misinterpret as tenosynovitis or joint synovitis with infection or injury.24 At high calcium concentrations (above 30% to 40%) susceptibility effects and decreases in proton density dominate, leading to signal intensity loss.25 However, T1 shortening effects resulting in hyperintensity on T1-weighted images are also present. They have been attributed to surface interaction of protons with calcified tissue. At lower concentrations of calcium, T1 shortening effects dominate, resulting in isointensity or even hyperintensity.25,26 Gradient echo sequences best show these calcific foci. We reviewed the clinical and imaging features of 3 crystal deposition arthritides and illustrated their common and uncommon radiologic, CT, and MRI presentations. Tehranzadeh J. Musculoskeletal imaging cases. New York, NY: Mc Graw Hill; 2008. Nuki G. Gout. Medicine. 2006;34:417-423. Lagoutaris ED, Adams HB, DiDomenico LA, Rothenberg RJ. Longitudinal tears of both peroneal tendons associated with tophaceous gouty infiltration: A case report. J Foot Ankle Surgery. 2005;44: 222-224. Pfister AK, Schlarb CA, O’Neal JF. Vertebral erosion, paraplegia and spinal gout. AJR Am J Roentgenol. 1998;171:1430-431. Pascual E, Jovani V. Synovial fluid analysis. Best Pract Res Clin Rheumatol. 2005;19:371-386. Bond JR, Sim FH, Sundaram M. Radiologic case study: Gouty tophus involving the distal quadriceps tendon. Orthopedics. 2004;27:90-92. Miller LJ, Pruett SW, Losada R, et al. 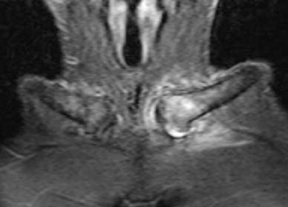 Tophaceous gout of the lumbar spine: MR findings. J Computer Assisted Tomography. 1996;20:1004-1005. Watt I, Middlemiss H. The radiology of gout. Clin Radiol. 1975;26:27-36. Chen CKH, Yeh LR, Pan HB, et al. 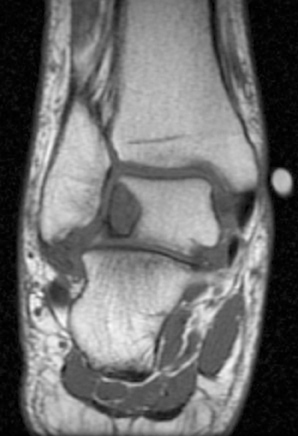 Intra articular gouty tophi of the knee: CT and MRI imaging in 12 patients. Skeletal Radiology. 1999;28:75-80. Yu JS, Chung C, Recht M, et al. 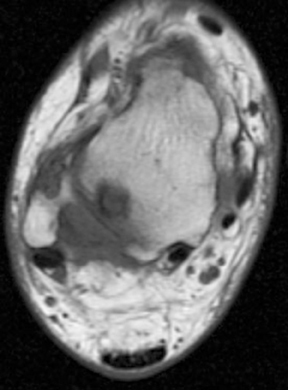 MR imaging of the tophaceous gout. AJR Am J Roengtgenol. 1997;168:523-527. McCarty DJ, Hollander JL. Identification of urate crystals in gouty synovial fluid. Ann Intern Med. 1961; 54:452-460. McCarty DJ, Kohn NN, Faires JS. The significance of calcium pyrophosphate crystals in synovial fluid of arthritis patients: the “pseudogout” syndrome. Ann Intern Med. 1962;56:711-737. Zitnan D, Sitaj S. Chondrocalcinosis polyarticularis (familiaris): Roentgenological and clinical analysis. Cesk Rentgenol. 1960;14:27-34. Timms AE, Zhang Y, Russell RG, Brown MA. Genetic studies of disorders of calcium crystal deposition. Rheumatology. 2002;41:725-729. Scotchford CA, Greenwald S, Ali SY. Calcium phosphate crystal distribution in the superficial zone of human femoral head articular cartilage. J Anat. 1992;181:293-300. Doherty M, Dieppe P, Watt I. 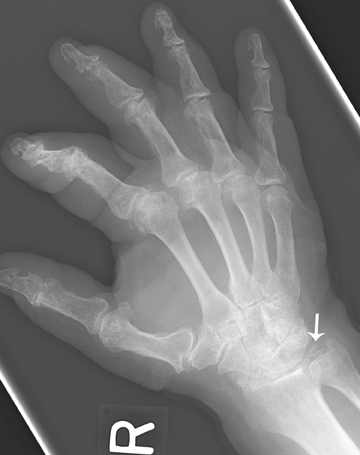 Low incidence of calcium pyrophosphate dihydrate crystal deposition in rheumatoid arthritis, with modification of radiographic featuers in coexistent disease. Arthritis Rheum. 1984; 27:1002-1009. Martel W, Champion CK, Thompson GR, et al. A roentgenologically distinctive arthropathy in some patients with the psuedogout syndrome. Am J Roentgenol Radium Ther Nucl Med. 1970;109:587-605. Steinbach LS, Resnick D. Calcium pyrophosphate dihydrate crystal deposition disease revisited. Radiology. 1996;200:1-9. Giachelli CM. Inducers and inhibitors of biomineralization: Lessons from pathological calcification. Orthod Craniofacial Res. 2005;8:229-231. Gondos B. Observations on periarthritis calcarea. Am J Roentgenol Radium Ther Nucl Med. 1957;77:93-108. Bui-Mansfield LT, Moak M. Magnetic resonance appearance of bone marrow edema associated with hydroxylapatite deposition disease without cortical erosion. J Comput Assist Tomogr. 2005;29:103-107. Jim YF, Hsu HC, Chang CY, et al. Coexistence of calcific tendonitis and rotator cuff tear: An arthrographic study. Skeletal Radiol. 1993;22: 183-185. Leitersdorf E, Reshef A, Meiner V, et al. Frameshift and splice-junction mutations in the sterol 27-hydroxylase gene cause cerebrotendinous xanthomatosis in Jews of Moroccan origin. J Clin Invest. 1993;91:2488-2496. Zubler, C, Mengiardi B, Schmid MR, et al. 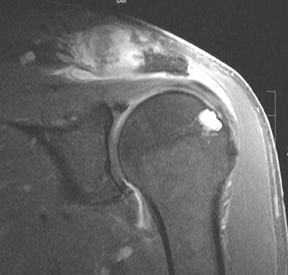 MR arthrography in calcific tendinitis of the shoulder: Diagnostic performance and pitfalls. Eur Radiol. 2007;17:1603-1610. 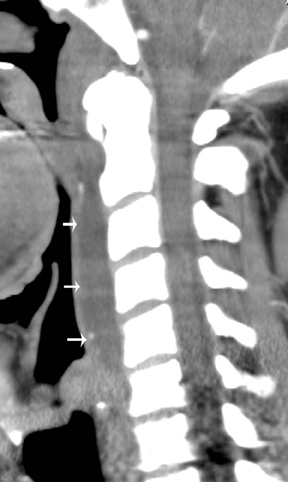 Wasserman E, Richman A, Erdag N, Weiss R. Acute calcific prevertebral tendonitis of the longus colli muscle. Applied Radiology. 2009;38:169. Offiah, CE, Hall E. Acute calcific tendinitis of the longus colli muscle: Spectrum of CT appearances and anatomical correlation. Br J Radiol. 2009;82:117-121. Farpour F, Phan SJ, Burns J, Tehranzadeh J. 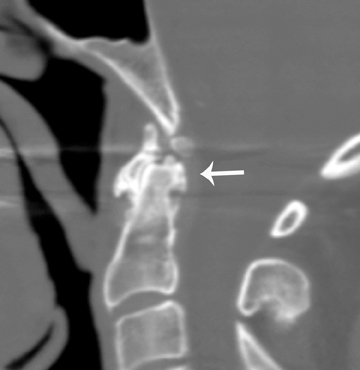 Enhanced MR imaging of the shoulder, and sternoclavicular and acromioclavicular joint arthritis in primary hemochromatosis. Rheumatol Int. 2011;31:395-398. Epub 2009 Oct 14. Imaging of crystal deposition disease. Appl Radiol.